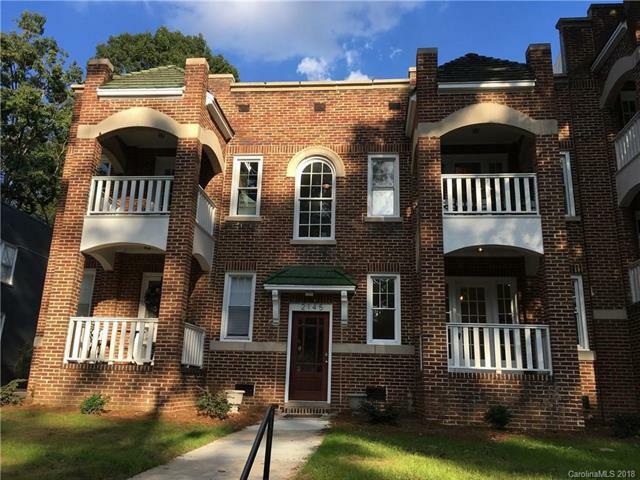 2145 Kirkwood Avenue #4, Charlotte, NC 28203 (#3456109) :: Caulder Realty and Land Co. LOCATION & CHARM - LAST ONE-BEDROOM UNIT ON TOP FLOOR IN DILWORTH! New quartz countertops, sink with brand new back door in kitchen. Tile flooring both in kitchen and bathroom. Original beautiful stained hardwood floors with updated light fixtures throughout the house including remote controlled fan in bedroom. HVAC is less than a year old with WiFi thermostat adjustable right from your phone. HVAC also includes a 10-year transferrable warranty. Fresh paint and lots of natural light. Private covered balcony overlooking quiet street. Walking distance to grocery, shops, and restaurants. Convenient to Uptown, South End, and South Park. Local bus stop and light rail nearby for easy commuting. Sold by Exp Realty Llc. Offered by Exp Realty Llc. Copyright 2019 Carolina Multiple Listing Services. All rights reserved. The data relating to real estate on this Web site derive in part from the Carolina Multiple Listing Services, Inc. IDX program. Brokers make an effort to deliver accurate information, but buyers should independently verify any information on which they will rely in a transaction. All properties are subject to prior sale, change or withdrawal. Neither Caulder Realty & Land Co. nor any listing broker shall be responsible for any typographical errors, misinformation, or misprints, and they shall be held totally harmless from any damages arising from reliance upon this data. This data is provided exclusively for consumers' personal, non-commercial use and may not be used for any purpose other than to identify prospective properties they may be interested in purchasing. © 2019 Carolina Multiple Listing Services, Inc. Data last updated 2019-04-21T13:58:27.917.